Charming spacious cottage with 1 or 2 bedrooms in a beautiful country setting. Great for couples, solo adventurers, business travelers & families! Walking, biking, 5 min. walk from Coles Beach, 5 min drive to airport, 30 to Victoria, near ferries, Sidney & Butchart Gardens. Lots of things to do within 35 minutes or less! We call our vacation rental "Petie's House". "Petie" was the nickname for our grandmother. The house is 1150 sq ft with all the comforts of home! My grandmother was an amazing cook and gardener. I have wonderful memories of sampling her cookies, pies, jams and out of this world bread. My grandfather's and family especially loved her "grumpa cookies". Maybe you will also get inspired and do your own fabulous cooking and baking! The cottage is open concept with a vaulted ceiling which makes the house spacious and comfortable. Large kitchen includes a dishwasher, full sized stove, fridge and microwave. Full laundry facilities in the kitchen and rack to hand dry clothes such as bathing suits. Off the kitchen is a dining room area with a large table and chairs and then drops down to a sunken living room with propane fireplace and flat screen TV over the mantel with a comfy LazyBoy queen size sleeper. Lots of windows and heat pump system so you can be as cool or warm as you need! One bedroom has a queen size bed, flat screen TV and lots of closet space including a large dresser. We have also provided an upholstered chair to sit and read or pull your shoes off. The second bedroom is connected through a short breezeway. 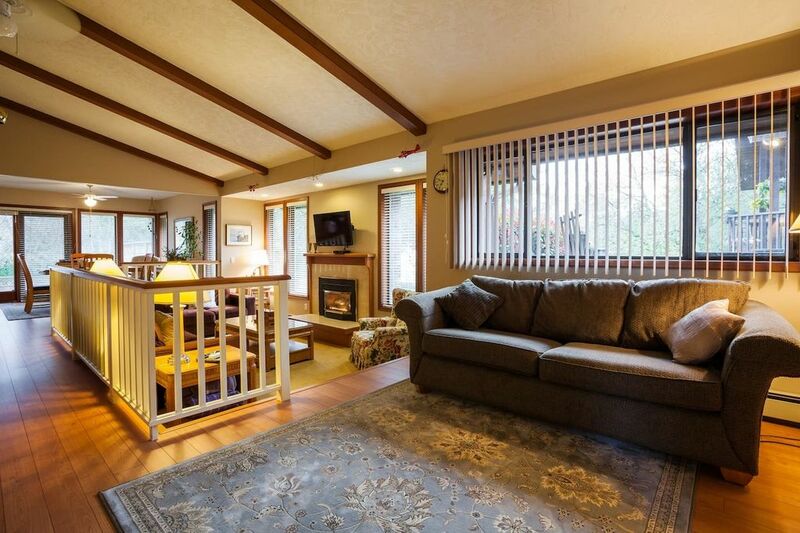 Rock hearth and electric fireplace, flat screen TV/WIFI/PVR, coffee/tea station, queen size bed and lots of windows. Very private and one of our guest's favorite rooms. The bathroom is large with a tub, separate shower, full size vanity and more storage space. We also have a private deck for the guest house screened off on one side from the rest of the yard and main house. Table, chairs and barbecue! Brunch on Saturdays - $19.50 per adult, $8.00 for children under 7 to 12, free for under 6. The cottage was more than a cottage. nicely appointed. we had a great stay. and will come back.